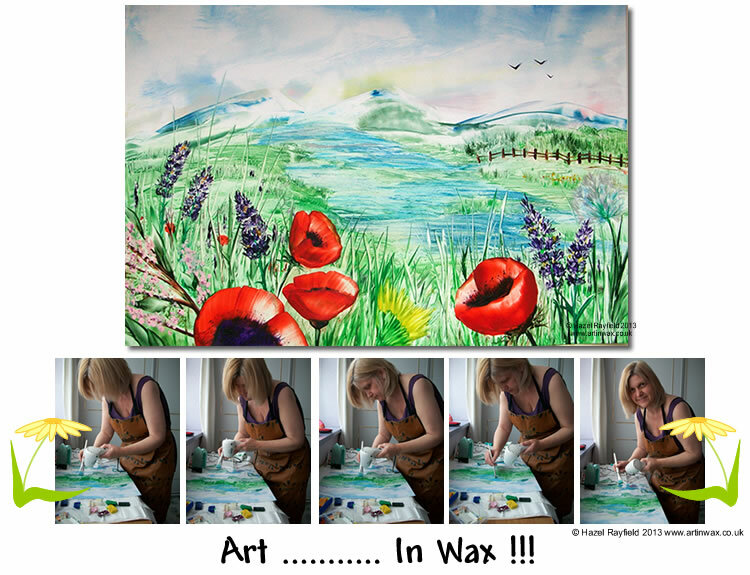 This latest painting in hot wax has a mountain landscape as the back drop to some colourful wild flowers, including Poppies, Wild Lavender, plus a couple of dandelions for good measure. The pictures is A3 in size approximately 11 x 16 inches. 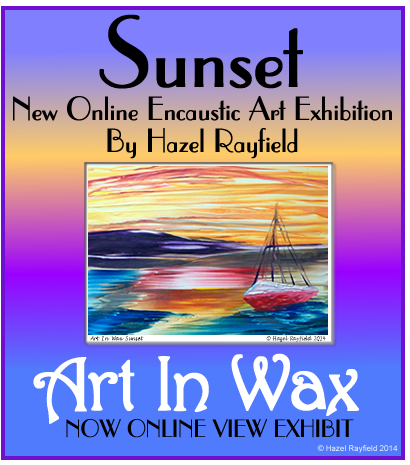 It has been mentioned to me many times including in a comment on my blog that my style of encaustic art in very “painterly”, I take this as a compliment. 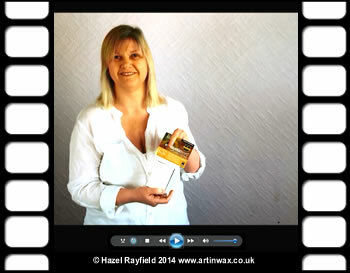 Some other styles of working in wax, hot or cold can be more sculptural and other more crafted. I like to think I “paint” in hot wax. I use lots of tools in my work, from heated irons to stylus tools, plus a hot plate and hot air heat tool. In the pictures below, Adrian (my husband) took these of me while I painting this week, you can see I am using a paint brush and heat tool, which is a craft heat gun not a hairdryer although it is a similar shape. A hair dryer blows the air too this just heats. 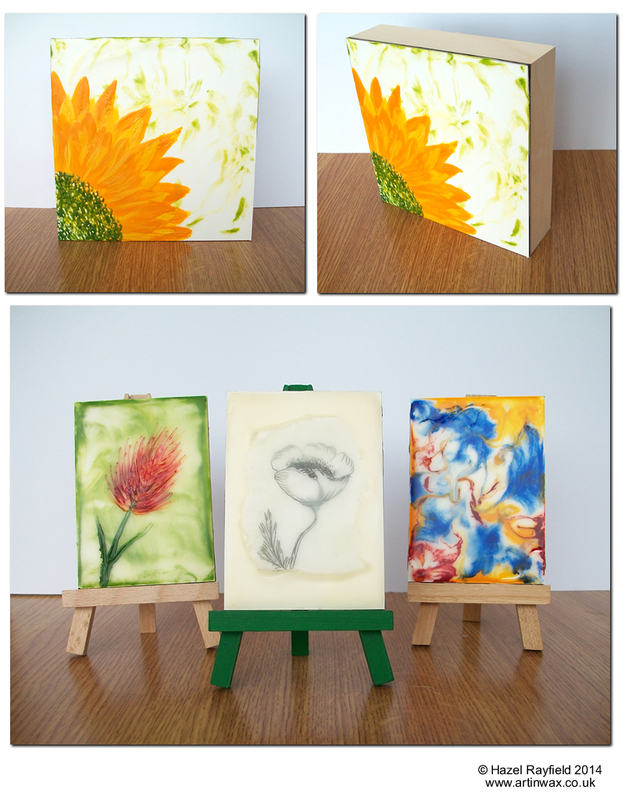 I need to heat the wax on the surface enough to keep it flowing, but not to much, as this can damage the surface which is a specialist encaustic gloss card. The photos me using two sizes of brush, these are natural fiber Hogs hair brushes, which I keep warm, but not hot with the heat tool as I paint with them in the wax. 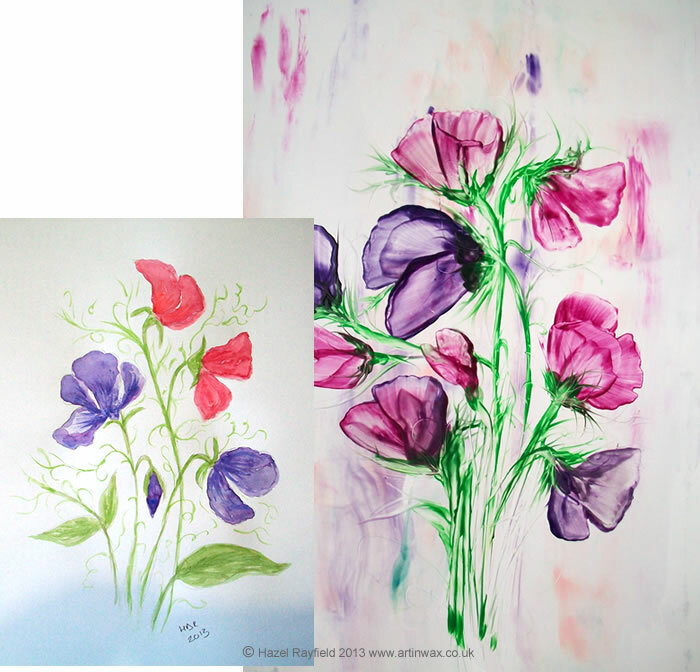 The painting of wild flowers was created using a combination of tools. The hot air and brushes to create a very thin layer of wax for the river and some of the greenery, working with the brushes gives me the lightness and control I want in this area, plus a smoother texture. The detail in the flowers is done with the stylus tools, using different nibs to get fine lines and shapes, and the sweeping red of the poppies is created using the edge of the iron tool, I liken this to how we might apply oil or acrylics with a knife. If you like this painting and would like to share it please do using the buttons below. And if you would like to leave me a comment that would be great too.